Telecom operator Bharti Airtel recently revamped its Rs. 93 prepaid recharge plan by increasing the validity period. Airtel's Rs. 93 prepaid recharge plan now offers 1GB or gigabytes of 3G/4G data for 28 days, without per day data cap. Airtel's all new Rs. 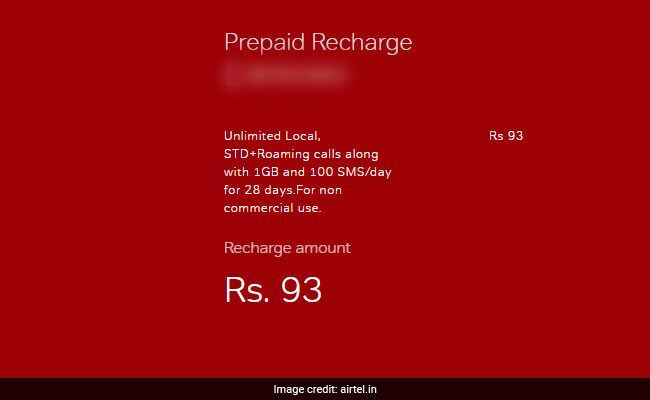 93 prepaid recharge plan now directly competes with Reliance Jio's Rs. 98 prepaid recharge plan. Jio's Rs. 98 prepaid recharge plan offers 2 GB of 4G high speed data for a period of 28 days with no daily cap. However, this new Rs. 93 recharge plan from Airtel is available only for select users (mostly in Andhra Pradesh, Telangana circle). For other users, Airtel's Rs. 93 prepaid recharge plan offers 1 GB of 3G/4G data for 10 days, without any daily cap. Other benefits remain the same for all circles. Airtel's Rs. 93 prepaid recharge plan also gives users unlimited local, STD and roaming calls along with 100 SMSes (short message service) per day. This prepaid recharge plan is allowed for non-commercial use only, said Airtel on it's website, airtel.in. The validity of the plan is 28 days. Jio's prepaid plan priced at Rs. 98 offers 2GB of 4G high speed data for a period of 28 days, without any daily cap limit. The data speed gets reduced to 64Kbps once the data limit is exhausted, Jio mentioned on its website. Free and unlimited local, STD and roaming voice calls are also available with this prepaid plan. This prepaid recharge plan also gives 300 free SMSes. Users also get complimentary subscription to suite of Jio apps. The validity of this plan is 28 days. Airtel and Hotstar on Monday announced a strategic partnership to bring exciting digital content from Hotstar's portfolio to Airtel customers. This will further expand Airtel TV app's wide range of offerings and expand the footprint for Hotstar's content across Airtel's large mobile customer base.